life with our dog feels like a walk in the park. 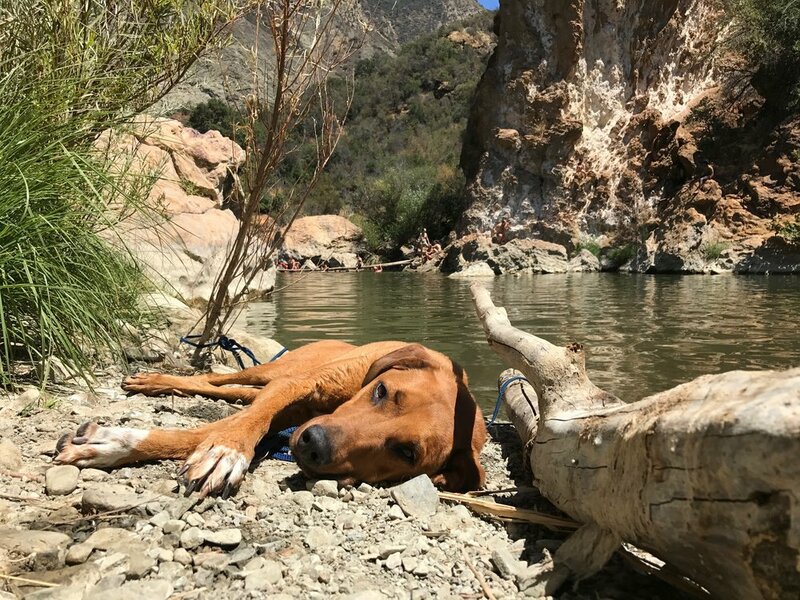 Here is Bodhi resting by the river after a hike at Redrock. "After 7 years & 3 trainers our Doberman-Ridgeback rescue was within days of being put down for fear based aggression. We were out of options. Eric took him, (and us) for a month plus ride with texts, videos, and coaching. I now have a new - different dog who is just a short step from perfect. I couldn't recommend Eric more highly as a dog trainer and dog owner coach. Eric is skilled, patient, and knows what he is doing. He saved my dogs life." - Keith T.
"I've been a dog lover and dog owner for many, many years. While I've loved my pets I always assumed their behaviors which drove me crazy were something that just came with the "dog owner" package. Since working with Eric, I've learned that with the proper training you can have a well behaved dog that brings you all of the joy of dog ownership without any of the anger and frustration. In the end, I am happier, and most importantly , Lena, my Shepherd/Rottweiler mix is happier. She understands the rules of the house, and by following them she has the satisfaction of always being a good dog. I only wish I'd known about Eric's training program years ago. Highly recommended." Here are the girls posing for a picture. Torah is on the far right focusing on her owner, Mj is to here left focusing on me.
" He has honestly been our dog trainer for our dogs' whole lives--6 years. We have two female Akita chow chow mutts that we take everywhere with us successfully thanks to Eric's training, advice and consultations. He is especially helpful with selecting the appropriate training tools for us to succeed. Positively the most notable are electronic collars and prong collars. Thanks to Eric and these tools we are successful at managing both our girls in high distraction environments and get compliments on their behavior and our training all the time. I cannot recommend eric enough he is thorough in his research, honest with his feedback and assessments, and clear and to the point with his help and training exercises and tips. Without Eric Stokell's dog training our dogs would likely be too aggressive and or out of control for us to take anywhere or let off leash. Because we were willing to really listen to him and make changes how we pet and reward our beloved animals, we enjoy off leash beaches and all kinds of amazing adventures in nature with our four legged family members. His dogs Henry and Taa are the best behaved dogs ever and have helped our dogs in showing them how to be calm and communicate. What an amazing pack to work with.Thank you Eric and follow the leader k9 training!